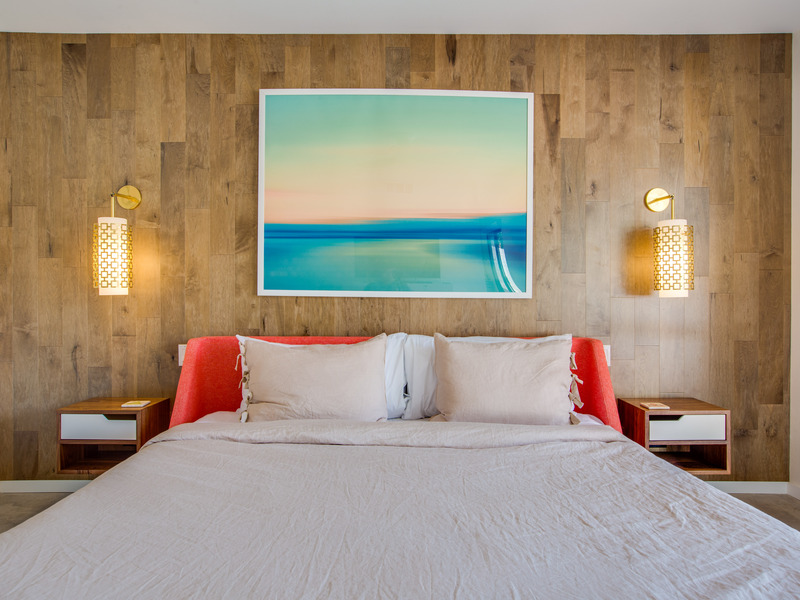 Lena's Hideaway has the classic look and feel of a midcentury home - with all the updates for the way we live today. 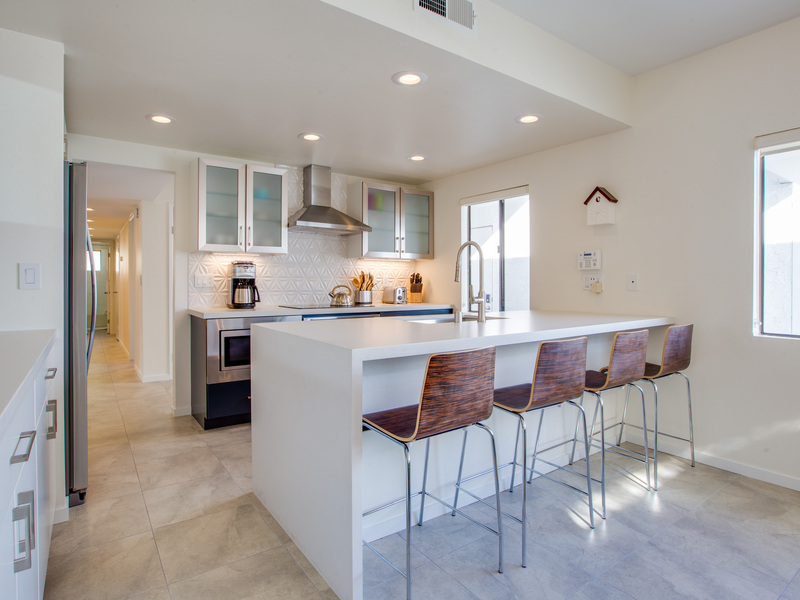 New kitchen, high speed internet access, 3 Smart Televisions, and gorgeous designer furnishings. 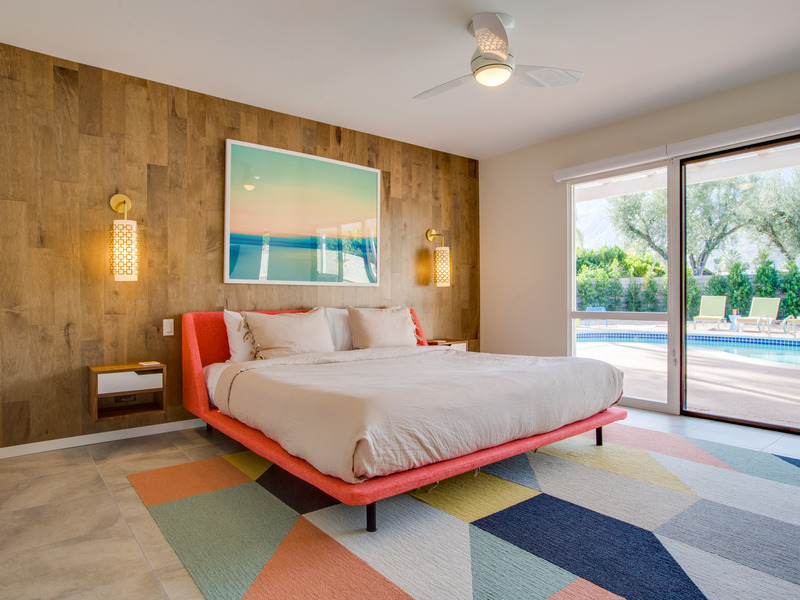 The property owners have created a comfortable and stylish vacation paradise where it's all about relaxing in the Palm Springs sunshine! There are so many great things about this property. But we think the it's all about location! Lena's Hideaway is located in the middle of Palm Springs. Close to Downtown, Uptown and South Palm Springs. You'll be just about a mile from Ruth Hardy Park, the Convention Center, the Casino and so many other attractions. Restaurants, shopping, hiking, golf and tennis are all nearby. 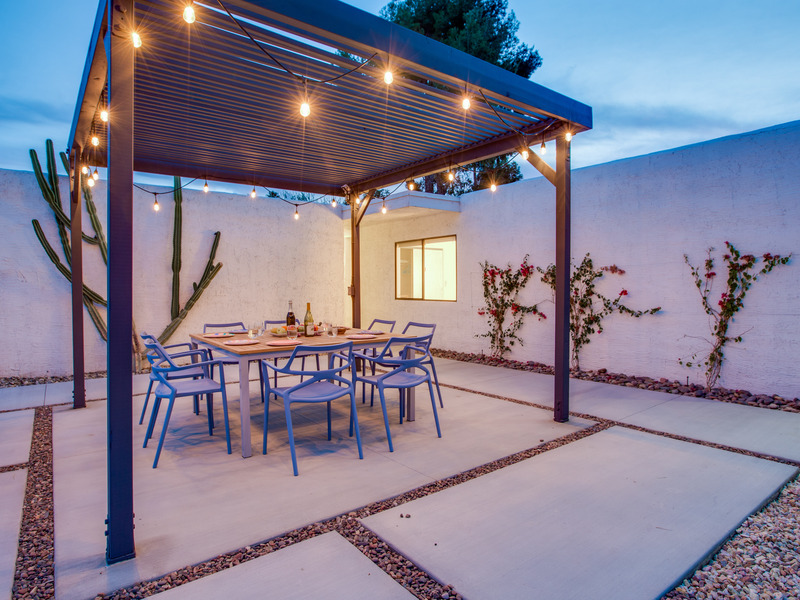 Lena's Hideaway is ideal for those who want to be in the center of it all - without giving up the residential feel of this cul-de-sac neighborhood. This home is bright, comfortable, impeccably clean and well-maintained. It is gorgeous in its simplicity - with an understated, unpretentious elegance throughout. You'll find that Lena's Hideaway is very livable' just like home but way way way better. 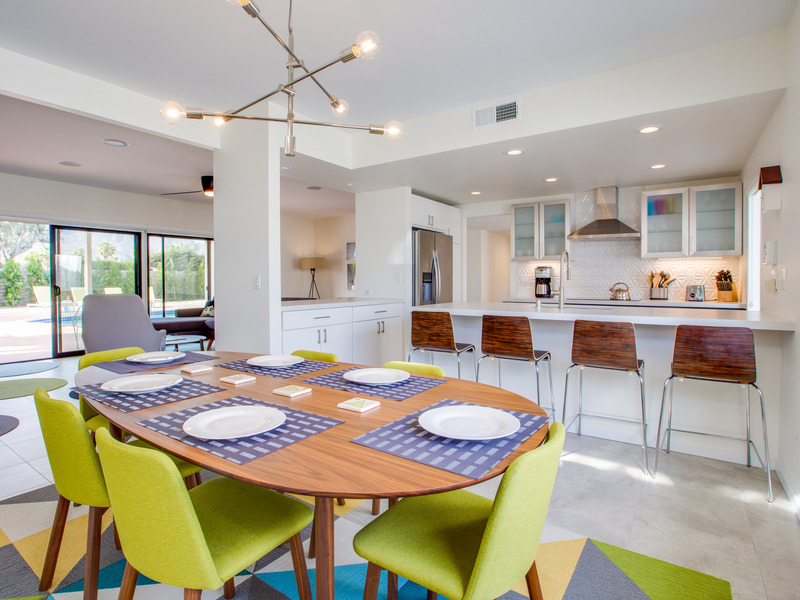 There is an open concept floor plan with the living room, dining area and kitchen all open to each other - providing enough space for your entire group to gather, relax and enjoy. All along the back of the house are spectacular walls of glass that let the light pour in - revealing the very private pool yard. Located on a residential cul-de-sac, this property captures the magic of Southern California glamour in true Palm Springs-style. The convenient city location is softened by privacy walls, mature plantings, towering palms and gorgeous landscaping that is drought-conscious and lush at the same time. The entire property has been walled and gated for privacy and is surrounded by many mature plantings. The backyard itself is a slice of heaven. So private, spacious and well-planned. The awesome mountain views through the swaying palm trees are pure magic. The heated in ground pool and integrated spa is surrounded by chaise loungers, shade umbrellas and an outdoor living room set. On the other side of the property is the covered dining pavilion, the bocce ball court and the firepit lounge area. "4 of us stayed here for a golf weekend, it was absolutely perfect. Clearly this place was recently remodeled, everything is very state of the art and super plush. Nothing like a nice swim/hot tub after a day of golf, followed by BBQ'ing and bocce ball tournaments. Conveniently located, close to the airport and downtown. Can't wait to go back! " "The house is just what we wanted, that is, a place for the kids to swim nonstop, plenty of room, a good location and super cute decor." Amazing time in Palm Springs! "We absolutely loved our stay at Lena's Hideaway. The house & outdoor area was top-notch. Beautifully renovated home, spacious and all the amenities. Yard was private and outdoor pool & hot-tub was a hit with the family. A bit of a busy street behind the backyard but otherwise perfect location. Would stay again." "Perfect house for 6 adults. Very clean, lots of room and a beautiful backyard. Very close to downtown shops and casino. We had a couple of minor issues with the property when we arrived and the property management company was extremely fast with their response and fixed the issue immediately." "I had the pleasure of staying at this place for the first weekend of Coachella this year and I can't say enough good things about it. It is centrally located and very great spot for the show. Aside from that, there is plenty to do around the area as well such as golf and locals bars and restaurants. The amentities were fantastic and the house is very well kept! Bocce ball court, pool, hottub and soo much more. View from the patio was spectacular and my friends and I couldn't have asked for a better place. I would recommend to anyone and will for sure be trying to come back!" "This property was what made our trip so special. We had an awesome time at the newly renovated hideaway. The location is perfect. We were able to play golf, swim, play bocci ball in the backyard, head downtown, and go to Coachella. If there were any problems at all (which there was not) the property manager was available at all hours making sure our stay was as comfortable and pleasing as possible. I really can’t thank the owner enough for letting us stay at this perfect getaway. For Coachella attendees, this house is everything you want. Close to the shuttle/fair grounds and comfortable for before and after. For any other residents, the spot is too perfect to pass up. Would 100% recommend this to everyone. Thanks again for making our trip so great!" "This home has it all!! Stayed at Lena’s Hodeaway with a bunch of buddies for Coachella weekend and was simply amazed at everything it had. The backyard is beautiful with views of the mountains and it is really nice to kick back and relax by the pool & spa. The bocci ball court was an unexpected surprise as my friends and I played for countless hours. The inside of the home is very new and modern. No complaints! Would definitely stay here again in a heartbeat!" "Lena's Hideaway was everything and more than the pictures show. If you love post modern design this is the house for you! Clean lines with great pops of colour. This house was impeccably clean and we never wanted for anything. We will be back! Susan and Brian"
"We just spent a week at Lena's Hideway for spring break, and what a great house. The location is great, very centrally located! The house appears to have just been remodeled it's beautiful and spotlessly clean. The kitchen is great and it's very well equipped. There are even big platters and bowls for serving meals and appetizers, Beds are comfortable, linens are nice quality and pillows were great. The yard is amazing...You could aways find sun or shade, whichever you prefer, and the Bocce court was great fun. 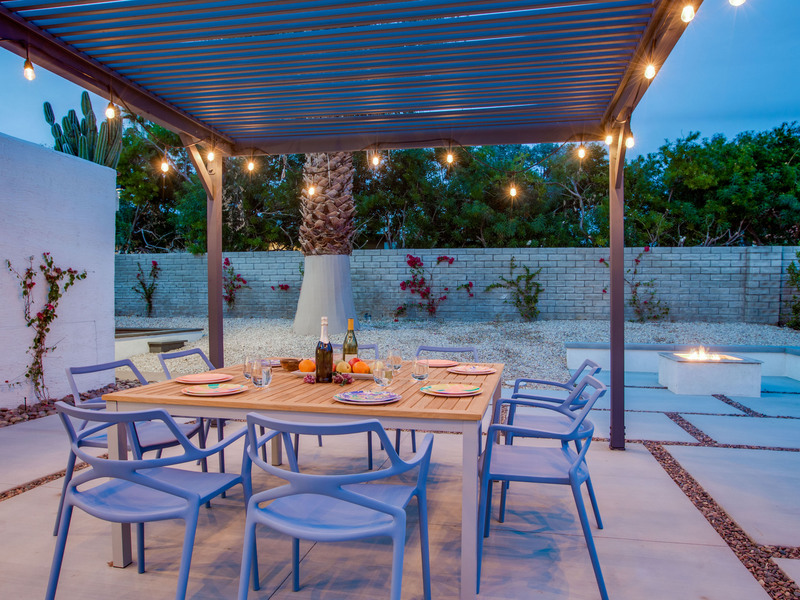 Having a large outdoor dining table with the built in grill and large counter made serving dinners easy. We found that having the table on one side of the house and the pool on the other allowed us to have quiet conversation at the table while kids played in the pool. 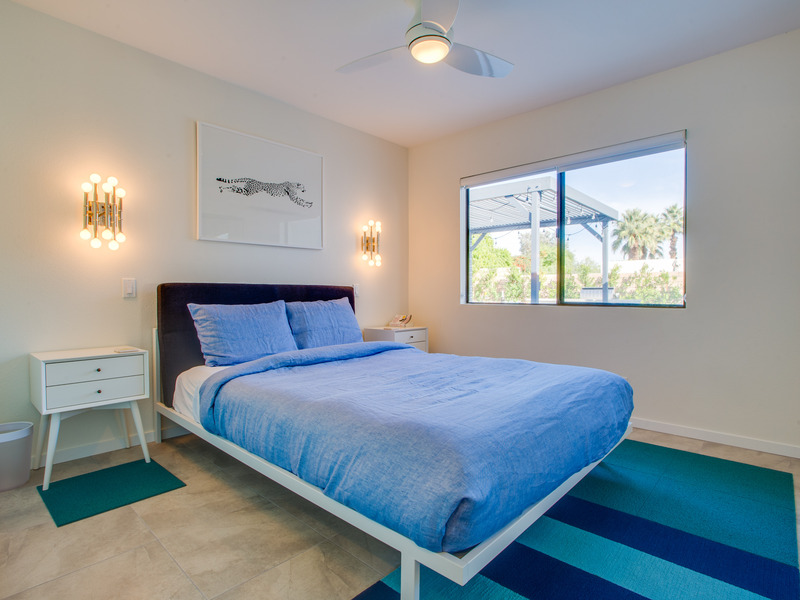 We have definitely found our "go to" house in Palm Springs. Thanks for creating and sharing such a great place. We will be back!" "Went down to Palm Springs for a golf trip and booked Lena's Hideaway. What a gem! They did an amazing job designing this place. The kitchen is open and large and equipped to cook a family size meal. Two full baths was plenty and we never ran out of hot water. The backyard is huge and has a couple of spots to hang out. 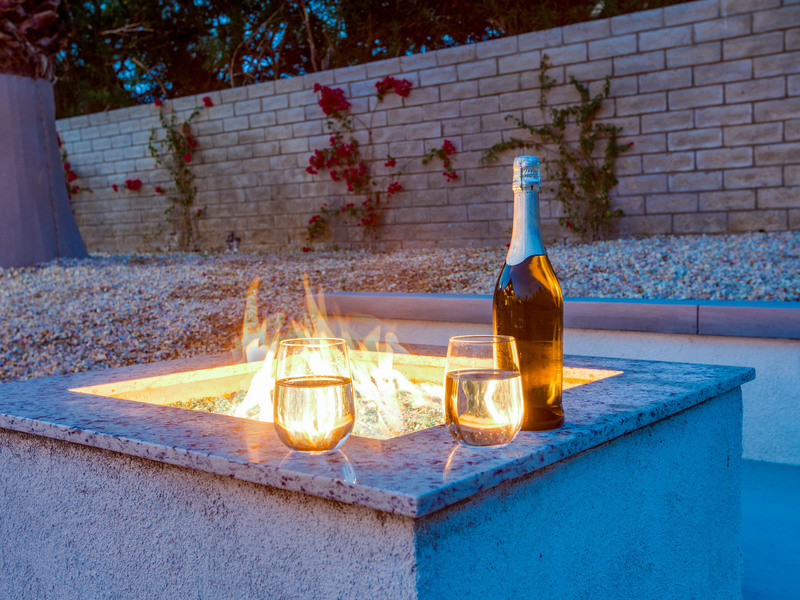 You can lounge by the pool or sooth sore bodies in the hot tub or you sit around the fire pit while your grill master grills a feast. There is also a bocci ball court so you can get you game on. I LOVE this house and can't wait to get back. It is also within minutes of tons of golf and closet to downtown if you want to go out and make a night of it. I'm def coming back." Awesome hideaway, the house is perfectly equipped for a getaway. "Well furnished and put together. The backyard is a dream! Pool, hot tub, awesome view, firepit, and a great bbq/dining area. Would definitely recommend this place!"